OTTAWA (Reuters) - Canadian Prime Minister Stephen Harper said on Wednesday he was not hopeful that the United States would approve the northern leg of TransCanada Corp's controversial Keystone XL pipeline. The U.S. government - under pressure from environmentalists to block the pipeline - has repeatedly delayed a decision on Keystone XL, which would take crude from Canada's tar sands to U.S. refineries. "A positive decision has not been rendered for a very long time and that's obviously not a hopeful sign," Harper said, referring to what he called "the very peculiar politics of this particular administration." 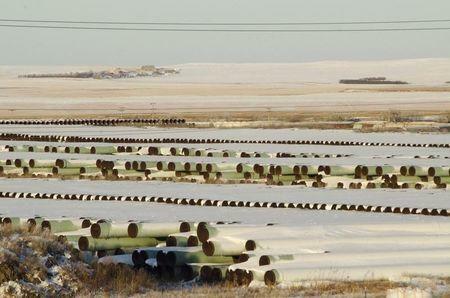 Harper has long publicly backed the pipeline and in 2011 called it "a no-brainer." The White House on Wednesday declined to provide an update on the review, which has been delayed for more than six years. Harper also said that while Ottawa was concerned about high levels of domestic consumer debt, "we don't believe there's any data that suggests any kind of a pending crisis there."